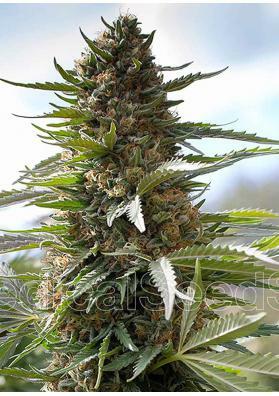 White Widow from Medical Seeds is a hybrid indica-dominant Marijuana strain, highly prized for its medicinal properties to treat chronic ailments. White Widow from Medical Seeds is a hybrid indica-dominant (60%) Marijuana strain created by crossing Brazilian and Southern India varieties. Thanks to its high content in CBD, this Marijuana strain is highly prized for its medicinal properties, especially for the treatment of chronic ailments. Its scent and taste are a subtle blend of sweet and bitter notes, while the effect is devastating, really intense. Its growth pattern is moderate, being ideal for the SoG technique. We recommend to move to bloom only when the plant has reached 25cm. In a growing room you will need to give it a growth period of 3-4 weeks to move to a bloom period of 55-60 days, offering productions of up to 450 grams per square meter. In the outside we recommend to sow it in early spring to achieve optimum productions. You will have it ready for harvest in early October, with yields that can reach 500-750 grams per plant.